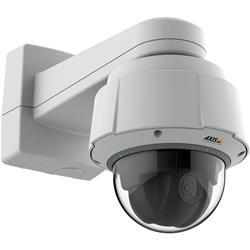 AXIS Q6055-E is an advanced PTZ dome that gives you both sweeping overviews and superb zoomed-in detail. Designed for demanding outdoor conditions, it's ideal for surveillance at airports, train stations, arenas, and any city-surveillance scenario - anywhere you need fast and precise, round-the-clock pan/tilt/zoom operation. AXIS Q6055-E features 32x optical zoom, which in combination with HDTV 1080p resolution provides superb zoomed-in views of people and objects of interest. For instance, you'll be able to read the license plate on a car from some 300 meters (984 ft.) away. AXIS Q6055-E also features Axis' Zipstream technology, which significantly lowers bandwidth and storage requirements while preserving high-quality images. With a robust aluminum casing, AXIS Q6055-E can withstand temperatures as low as -50 °C and as high as 60 °C (-58 °F to 140°F). Arctic temperature control ensures safe start-up at temperatures down to -40 °C, even after a power failure. And with IP66, NEMA 4X and IK10 ratings, you can rest assured that the camera housing is resistant to both harsh weather conditions and impacts.